U need to be carfule..In Part 1, we saw how Rob Bell and his wife have followed after Roman Catholic SPIRITUAL DIRECTORS and focused on the centrality of the Eucharist, and engaging in mystical practices. A common trait to these items is the lack of support found for them in the Bible. Rob Bell makes references to the power that is in breathing. He refers to the breath as being divine and discusses things such as the energy we can tap into while also mentioning concepts such as grounding, centering, inhaling and exhaling, mystical traditions, deep, meditation…etc. These are all commonly found in mystical religions and philosophies (New Age) as well as early Roman Catholic monasticism. For several years now, ROB BELL has been promoting RICHARD ROHR’s books and material heavy laden with MYSTICISM. With Rob “no Hell” Bell’s views about Hell and his strong leaning towards UNIVERSALISM, many within the Christian and Missionary Alliance Chruch (C&MA) along with many Evangelical Churches have moved away from Bell’s teachings, books, videos…etc. The IRONY of all of this is that there is a great deal of exposure to Roman Catholic mystic Richard Rohr in the C&MA denomination through their seminary, colleges, professors, and graduates who go on to become pastors in churches across the country. Bell and Rohr, show up together at events spreading their brand of mysticism to an unsuspecting audience. So, ding, ding – in an indirect way, the many within the C&MA who promote Richard Rohr are being exposed to Robert Bell (dare say, they are promoting Robert Bell indirectly to their students, church congregants …etc.). Let’s think this through from a high level – the C&MA is an evangelical church with foundational doctrines which differs significantly and fundamentally from Roman Catholicism. Going back to the Reformation, and the contentious relationship ever since, there are definite differences between Protestant/Evangelical theology and Roman Catholicism. While both sides of the debate will argue who is more correct, in a nutshell, Roman Catholicism emphasizes the church at an equal level to the Bible and presents a man-made works based system as opposed to the Protestant view which holds God’s word, the Scriptures as the ultimate authority. Protestants emphasize a grace-based relationship with God. With the emphasis on the church, it is no surprise that someone like the Roman Catholic mystic Richard Rohr, engage in many practices that don’t necessarily come out from the Bible but rather are based on early church tradition. A significant problem arises when one participates in practices that have no biblical foundation but are instead very similar or in fact, identical to other philosophies, faiths, religions…..etc. While many of these practices attempt to replicate what some early church fathers and ancient Roman Catholic traditions have done, when compared to Scripture, we find no solid justification for their use today. This can result in several adverse effects on the participant, the church…etc., not the least of which, it moves one further away from a close relationship with the one true God and instead opens one up to outside spiritual influences. When dressed up with spiritual sounding descriptions, these practices give the image of religious ceremony or of an intimate spirituality but in reality may not be biblical. When branded in religious sounding jargon, the subtleness of this experience makes it very difficult to realize that one is moving in this direction. The most important source for truth in measuring these experiences and practices is relying on what God has already said in his Word. The Bible is the source of truth and should be used to measure what these other practices are promoting (2 Tim. 3:16). Experience can be based on factors such as tradition, emotion, the popularity of certain practices in the church…etc. However, if not based on Scripture, false teaching can be introduced into the church or one’s personal walk. So, today Rob Bell has NOT faded from the scenery. He is still writing books, participate in speaking engagements, touring across the country and has paired up with Oprah Winfrey (who’s beliefs have spanned the range of philosophies and religions including the New Age) on her network to do a show aired on Sunday mornings. A few years ago, Rob Bell had begun recommending Richard Rohr’s book Everything Belongs: The Gift of Contemplative Prayer (EB), which is all about CCP. “Like all neo-gonostics Richard Rohr makes no real distinction concerning religions, which is why such as these are listening to what mystics of whatever stripe say. (Silva continued) Back in 2009 I showed you Richard Rohr: Roman Catholicism And Christian Universalism. That’s the eventual fetid fruit of CSM. So is it really any wonder that Rohr’s disciple Rob Bell would come to his Love Wins mythology. So, you can see how Rob Bell has been influenced by Roman Catholic mysticism as he and his wife follow after SPIRITUAL DIRECTORS, the centrality of the Eucharist, engaging in mysticism and moving further from the church, the Bible….etc. Enough for now, let’s look at the mystical concept of using breathing techniques in more detail in Part 2. Green has earned an undergraduate degree in Religious Studies, an M.A. in Theology from Fuller Theological Seminary. He will receive his Doctorate in Theology and Ministry this fall. As part of the promotional tour for his new book, America’s Original Sin: Racism, White Privilege and the Bridge to a New America, Jim Wallis conducted an interview with Religion News Service (RNS) to discuss the content and thesis of his book. The interview touched on why Wallis wrote his latest book in addition to a number of other issues including, oddly enough, reparations. “Isaiah 58 instructs us to be the ‘repairers of the breach’ and ‘restorers of streets to live in.’ We should lift that biblical language of ‘repairing’ into the conversation about ‘reparations.’ The terrible breach of racism in America must be repaired and healed. We can’t just be sorry about what has happened and still does; we have to fix and heal the continuing racial inequities. So we should have a national conversation about what that could mean—specifically. “Repairers of the breach” and “restorers of streets to live in” involves, of all things, government-led monetary redistribution in the form of reparations? I could be wrong, but I don’t think that’s exactly what Isaiah had in mind. Wallis is taking a biblical passage out of context and transparently applying it to a social movement that truncates some form of “justice” to curry favor with likeminded people and to sell books. In any case, no topic is more time wasting than the issue of paying reparations to blacks. It’s a considerable waste of time because it’s never, ever, going to happen. Nor should it. In reality, Wallis only wants to have a “conversation” about reparations because he knows how pragmatically unfeasible paying reparations to blacks would be. Why should blacks get reparations? Who decides? Why them? How much should blacks get? Whatever the amount that’s decided, why that amount and not slightly more/slightly less? And what blacks get reparations, all blacks or just some? Why? Do African immigrants get reparations too? After all, they’re “black.” What about president Barack Obama, whose father was Kenyan and mother was white? Should Obama – a man who successfully integrated one of whitest institutions in American history, the presidency, with the help of white people, and himself a millionaire – get a reparations check as well? Technically, he’s black too, so why or why not? If so, how much? Then comes deciding the morality of who pays reparations. Will all white people be forced to pay into this reparations scheme, including poor whites? Why? What about recent white immigrants from Eastern Europe who’ve come to America over the course of the past few decades? Are they responsible too? What about Mexican immigrants or immigrants from Central and South America? What about Asian immigrants and immigrants from Armenia? Should they be required to pay into a monetary scheme to receive absolution from racial sins they aren’t guilty of committing? Or, are they also guilty of benefiting from “privilege,” thus obligated to pay? Will all of these people be forced to have their income and wealth confiscated and redistributed to atone for America’s original sin, to ease white guilt as a costly gesture to compensate blacks for racial discrimination and oppression? What about the social welfare system that has routinely redistributed money and other resources to blacks for more than fifty years with little success? Many would call this ritual of national penance a system of reparations, and we still have racial disparities in too many socio-economic quality of life indicators. How will diverting more money and resources to blacks in hopes of (re)reshaping their collective destiny, without the necessary values and behavior modifications to accompany such a vast wealth transfer, be any different or better than what’s already been tried? This is what happens when economic solutions are the only solutions offered as answers to moral problems. Moral problems need moral solutions. No Christian should be talking about reparations because it’s a distraction. The effort and energy wasted on contemplating reparations should be put into commonsense ideas of what can and should be happening to rectify social and economic inequities blacks face. Much of it starts with black self-determination and responsibility, not romantic notions of coercing non-blacks to pay for alleged racial criminality and oppression. Not only is the talk about reparations a distraction, it does significant harm to blacks. Besides allowing another fruitless vehicle for blacks to focus their attention and energies on which offers no alleviation from social and economic stagnation, the idea of reparations reinforces in blacks an identity centered in a collective sense of victimization. In no other racial group does the idea of being monetarily compensated for embracing an unproductive, self-defeating sense of victimization exist. It’s a sad reality, and truly heartbreaking, but blacks are the only group in the country, because of a distorted sense of justice, that has willingly allowed themselves to be manipulated as a group to the point of de-stigmatizing helplessness as the cornerstone of their identity. No other group celebrates a historical sense of helplessness and victimization to be used as leverage for a false sense of social power (which actually reveals powerlessness). Blacks should center their identity in Christ as co-bearers of God’s image rather than a racial identity submerged in victimization. That Wallis, a self-identified Christian, would join in this racial scheme and racial manipulation undermines his professed concern for blacks. He simply and continually pretends to care about blacks with no regard for the consequences of his actions, or the fate of those he claims to defend. The same goes for applying reparations to reduce the racially disproportionate numbers of blacks that are incarcerated because it is allegedly another form of slavery. How will monetary reparations prevent people with bad values from going to prison? There are a lot of people incarcerated who had acquired lots of money and wealth, legally and illegally, prior to being imprisoned. So the idea that money can cure bad values, hence bad behaviors, is foolish and only exists on the political and religious Left. Slavery was an immoral system. Very few people dispute this. But what system of right and wrong deliberately equates the evil of slavery with rightly interning people who violate the law? Of course there are areas of the criminal justice system that need modification and repair, but Wallis and those who agree with him would deceive people into believing that the entire system is broken simply and only because so many blacks and other minorities are behind bars. They intentionally ignore the specifics of what these people did to deserve criminal detention. Wallis’ should be encouraging blacks to start the process of moral regeneration as a cure for moral poverty, which would go a long way toward reducing the excessive numbers of black prisoners. But Wallis’ ignores black self-determination and self-reliance for passing the blame and dependency. “…organizationally, Intervarsity still lives in the white evangelical world, with constituents and donors who have a negative response to honest and gospel talk about racism in America. This will be a very important and revealing case — whether an evangelical group like Intervarsity can move out of their white cultural context and support a new generation that wants to embrace diversity as a gift from God. Black Lives Matter’s racial agenda doesn’t consist of ‘honest and gospel talk about racism’ by any stretch of religious imagination. Not even close. Wallis insinuated that if InterVarsity – and by extension, white Evangelicals in general – rejects the kind of “diversity” represented by Black lives Matter, they’re complicit in unilaterally trying to maintain racial and religious marginalization of blacks. 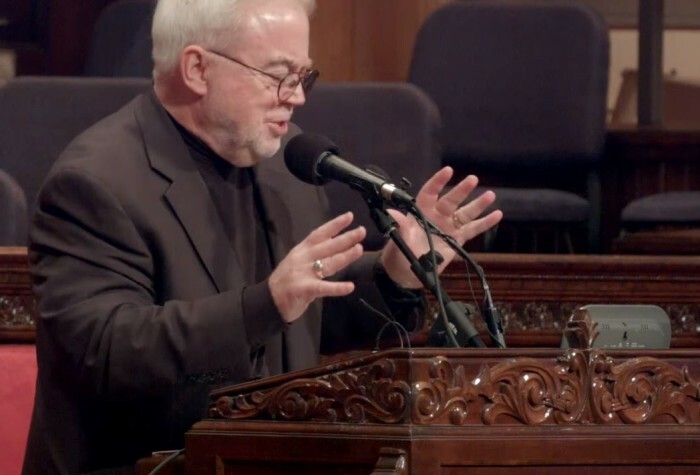 It’s no surprise that Jim Wallis supports Black Lives Matter. His glowing rhetorical compliments, like that which is found in his book, were delivered without a sense of irony. At the beginning of our nation’s history, many white Christians used racism to justify slavery for numerous reasons, but white Christians were also instrumental in ending slavery as well. Shouldn’t they be given ample credit for it? That Wallis, as a Christian, doesn’t spend more time on that inescapable fact – that his brothers and sisters in Christ were instrumental and unique in ending slavery – should be concerning to all Christians who seek racial harmony in the church. To be clear, Black Lives Matter can continue their sleight-of-hand by using an all-inclusive phrase to fool people into thinking that it’s concerned with having a direct and immediate impact on improving the quality of all black lives. But there is no obligation for Christians to support this group as evidence that they are serious about ending racial discrimination. Listening to progressive Christians, it becomes clearer that they are much more (politically) progressive than they are Christian. It is becoming more and more difficult to deny that our culture is being enveloped by principles found in Eastern religions as well as non-Christian beliefs. Today, it is certainly not unusual to hear words such as KARMA, YOGA, MEDITATION……etc. It affects many areas of life today, including areas of health, medicine, food, stress reduction…..etc. Unfortunately, even in the Evangelical community as well as most of American Christianity today, we see this same effect. Many Christians refuse to see this influence in church life, seminary teachings, popular books, teachings on the radio…..etc. In case you are not seeing it yet, here is Newsweek’s recent special edition on the topic of “SPIRITUAL LIVING” where they are just too happy to share with their readers views from every religious philosophy they can. C&MA’s ‘Rohring’ Deeper Into MYSTICISM. Let me first say, there is much to commend in the C&MA. In many ways, it has set a high standard in areas such as cross-cultural missionary work around the world. It is looked at by other Christian groups and denominations as having much to emulate in their missionary endevours. Along with that, they carry with them a broader focus with their emphasis on JESUS in everything they do. They tend to lean on the conservative side of many theologically issues and have high view of Scripture as God’s word. Personally, I appreciate their balanced approach to viewing issues such as the gifts of the Spirit – taking, in my view, a biblical approach to issues like this. All of this is funneled into a church actually living out our Christian walk both in the local community and around the world. That said, there is no perfect church. Sadly, along with the C&MA, there are many within the broader Evangelical Church which are stearing their ships in a direction that moves further from Scripture and closer to ancient church tradition. With this, we are seeing the inclusion of other religious practices being mixed in with Christian practices with Christian sounding titles and names. Fresh off the SEEKER-SENSITIVE MOVMENT from the 1990s, today we are seeing the effects of contemparary movements such as the EMERGING CHURCH which are bringing in concepts and ideas that move Christians away from the Bible and instead point Christians in a direction that looks more to tradition and mystical practices. I bring these issues up because it burdons me to see the path that some/many within the C&MA are heading which has to result in changing the church in the long run if nothing else changes their course. How could it not? Mysticism focuses more on the “DEEP“, “INTERNAL”, “TRANSFORMATION” of the INSIDE as they strive to be UNIFIED with God. According to this line of thinking, it opens up to joining with other people in the world today who look internally to be unified with God, unified with each other, unified with nature, unified with other creatures….etc. Why should we “do Missions” when we can strive for this internal unity right where we are? In previous postings, we looked briefly at how C&MA seminaries and colleges are being influenced heavily in areas of ancient Roman Catholic and Eastern mysticism. At Nyack and Alliance Theological Seminary (ATS), we see the training of the next generation of pastors and leaders across a wide spectrum of exposure. For example, some professors spend time at ROMAN CATHOLIC MONASTERIES practicing their SPIRITUAL DICIPLINES of SILENCE and STILLNESS over periods of days and weeks. During these times, they converse with monks who teach them the so-called rich history of ……the Bible – No! Rather they instruct them on the ways of ancient monastic practices of the DESERT FATHERS & MOTHERS. They acknowledge that the similarieties to modern Eastern Mysticism found in many Eastern Religions today. The attitude is that we can learn from others who supposedly engage in similar religious practices in which Evangelical Christians could learn a great deal from……etc. Some scholars believe that the early DESERT FATHERS were also influenced by EASTERN MYSTICISM during their time in ancient Egypt. We also see course work at C&MA seminaries and colleges based on Roman Catholic and now Evangelical promoters of mysticism through Christian sounding jargon such as SPIRITUAL DISCIPLINES and SPIRITUAL FORMATION. The trend is to study ancient church history to see firsthand how these practices were developed in the EARLY CHURCH. Simpley stated the reasoning goes something like this – If its from the EARLY CHURCH, it must right? Right? Contemporary authors/teachers are studyied such as RICHARD ROHR, RICHARD FOSTER, DALLAS WILLARD, RUTH HALEY BARTON…..etc. applying the modern versions of these same mystical practices found in ancient Roman Catholicism and Eastern Mysticism. So, let’s continue on with one of these teachers – RICHARD ROHR. His material is being used in classes at Nyack / ATS. There are professors who are actively contributing to journals from Richard Rohr’s organization – the previous post, we looked at this in more detail. Today, let’s look further on other areas dealing with what Rohr believes and how he is influencing Evangelicals today. Again, Richard Rohr is a Roman Catholic priest, and a leading proponent of CONTEMPLATIVE MYSTICISM today. We could spend a great deal of time on differentiating ROMAN CATHOLICISM and EVANGELICISM but let’s start out taking small steps. Take a look at this brief video and see how may issues are brought up that Rohr glosses over but really conflict with how many views held by Evangelical and most importantly, the Bible. Some of these include UNIVERSALISM, PURGATORY, ORTHODOXY,..etc. It is no accident that with this topic, another name is brought up – ROB “ALL IS SWELL WITH NO HELL” BELL. Rob Bell has done a number of things with Richard Rohr and according to this clip, Rob Bell will be teaching (if not already) at Richard Rohr’s new school. What amazes me is how these supposed Evangelicals seemingly take in everything Rohr is saying. But this effect is becoming more and more common in today’s environment.